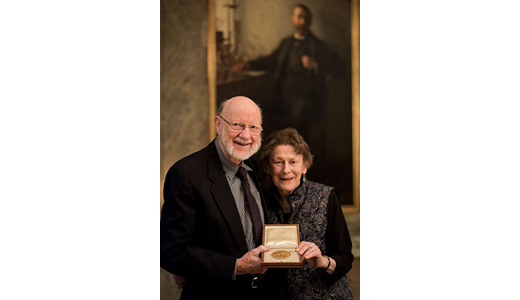 The Irish-born biologist and parasitologist William Cecil Campbell, who was awarded the 2015 Nobel Prize in Medicine, talks to Patricia Harty. For those of us fortunate enough to turn a simple tap to take a nice relaxing bath or long hot shower, it’s hard to imagine risking the loss of your eyesight for a single bucket of water. But for centuries, onchocerciasis, commonly known as river blindness, had plagued remote communities in Africa, Latin America, and Yemen. Lifelines for villagers, the rivers are breeding grounds for black flies that, infected with a parasite worm, transmit the disease through repeated biting. In return, those infected transfer the disease to uninfected flies who bite them, resulting in a plague characterized by extreme itching and eventual blindness. That the simple chore of getting water in these communities is no longer as much of a danger as it had been for generations is due to William “Bill” Campbell, an Irish-born scientist who, with his colleagues at Merck Research Laboratories, discovered a novel therapy for treating the disease. 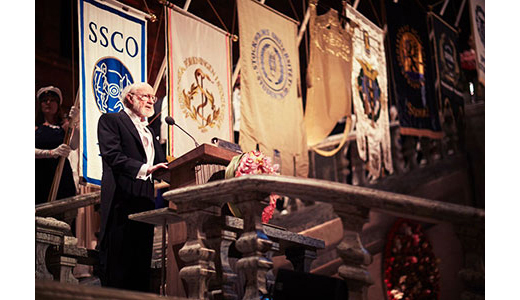 In 2015, he was awarded the Nobel Prize in Physiology or Medicine, sharing it with Satoshi Ōmura of Japan. One wonders why it took so long. It was in the late 1970s when, working with a batch of microbe strains that Ōmura sent over for evaluation, Campbell developed a drug using ivermectin (later named Mectizan) and suggested it would work for river blindness in humans. Not only did the drug work, it also proved effective against the parasite that causes elephantiasis (so-called because of the elephant-like appearance of swollen limbs in severely affected cases), which co-exists with river blindness in many places. More than 25 years later, since Merck made the drug free in those countries most affected, treating 250 million annually, the results speak for themselves. Several countries in Africa are making significant progress towards eliminating both diseases. In Latin America, three countries – Colombia, Ecuador, and Mexico – have effectively eliminated river blindness. 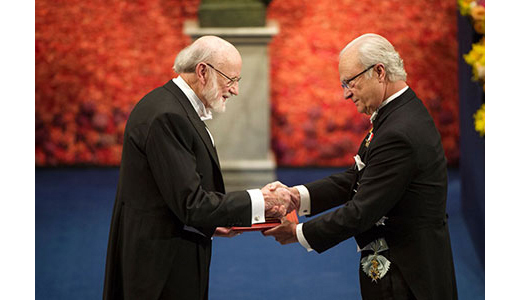 Campbell, who at 86, is fit and trim with twinkling eyes, a keen mind, and self-effacing wit, is also decidedly modest about his Nobel Prize. 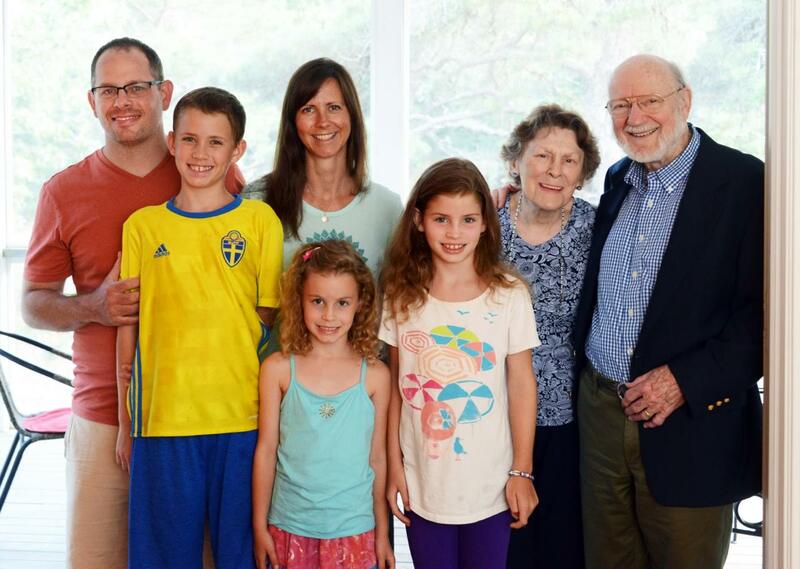 “I think of it as an award in which I’m the representative of the Merck company’s research teams,” he said in one of several phone conversations that I had with him over the summer, prior to a meet up in Cape Cod, where he and his wife, Mary, children (two daughters and a son), and five grandchildren had gathered for a vacation in early August. The respite is a welcome break from all the attention that being a Nobel laureate has brought. He had settled into retirement in North Andover, MA, enjoying time with Mary (they met at a church function in Elizabeth, NJ over 50 years ago), his three-times weekly doubles ping pong games, solitary kayak trips in early morning, an occasional hike up nearby half-mile hill, and painting and writing poetry that reflects his passion for roundworms and other kinds of parasitic worms. Campbell’s appreciation of nature is rooted in his childhood. He grew up in Ramelton, a small farming town in County Donegal, with two older brothers and a younger sister. The town is situated on mouth of the River Lennon, in one of the most beautiful and remote spots in Ireland. His parents, Sarah Jane Campbell (née Patterson) of Dunfanaghy, and R.J. Campbell of Fanad, ran a general store, supplying farmers. His father also farmed, raising shorthorn dairy cattle that won prizes at agricultural shows. And it was at an agricultural show that 14-year-old Campbell picked up a leaflet on fluke worms in sheep that, in hindsight, may have influenced his interest in becoming a scientist. But then Campbell could just as easily have become a writer, an artist or a historian. His teacher during his formative years, Miss Martin, “instilled a love of learning, not in the sense of a chore to be mastered, but getting the satisfaction of knowing something, and remembering something. She had a tremendous influence on me,” he says. Desmond Smyth, the renowned parasitologist, who was Campbell’s science professor at Trinity College, was another key influencer. “He changed my life by developing my interest in parasitic worms,” he says. After graduating with first class honors in zoology from Trinity, Campbell went on to the University of Wisconsin–Madison where he earned a Ph.D. in 1957 for work on liver fluke in deer. Headhunted by Merck out of school, he stayed with the company for over 30 years developing many significant drugs, including a treatment for trichinosis. After his retirement from Merck, Campbell taught undergraduate biology and graduate history at Drew University until 2012. You have lived here a long time. Do you feel more American than Irish as the years go by? Well, I feel both and that may seem strange. I never ceased to feel Irish but I also feel American. I am proud to be American and I am proud to be Irish and proud to be a citizen of the U.K.
Tell me about growing up in Donegal? My father started with a little grocery shop and built it up over his lifetime into a general merchant store selling farm equipment, hardware, kitchen utensils, and chinaware – just about everything. Sometimes the farmers would come in at lunch time when the shop would be closed but my father would always get up, much to my mother’s distress, and go out and talk to farmers. It wouldn’t have occurred to him not to open the shop for some farmer who had maybe come in from a long distance. He was a natural entrepreneur and businessman. He also farmed. He just loved to do that. He grew a lot of potatoes and oats, and raised dairy cattle. He used to take his purebred dairy shorthorns to shows. One thing that sort of typified my father, was that he brought electricity to the town. He hired people to set up the poles and the wires to bring electricity to the whole town. He bought this big generator – the engine room that housed it was behind our house. When we were in bed, we could hear this generator going through its paces before it settled down into a steady rhythm. People in those days who had battery-powered radios would bring them to my father’s shop to get them charged. Then after the war, he bought three or four smaller diesel-fueled generators. I had wonderful parents. My mother was saintly. I don’t use “saintly” in a religious or liturgical sense, though she was devout, but rather to convey a sense of her profound goodness. She was very caring. I never heard her say a bad thing about anyone. 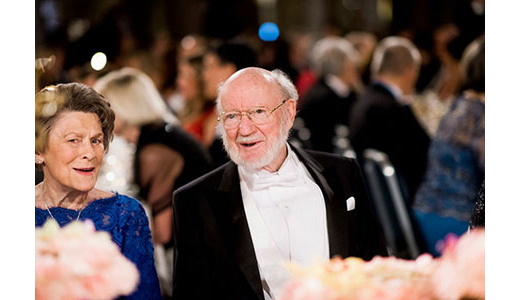 Has your life changed since the Nobel Prize? There is no way you can stop it from changing your life because there is just a constant barrage of invitations and letters and emails and requests. And while they are all wonderful to have, there are just so many of them and I am now very ancient and have no secretary or manpower or secretarial skills, it is stressful for me. Whether I say yes or no, it is just a constant preoccupation, especially if the invitation is from someone I know, and I have a lot of speeches to give and lectures to write. 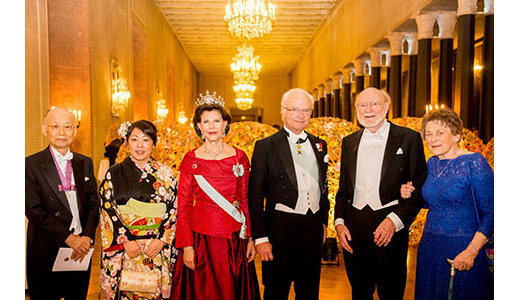 The Nobel experience itself was just out of this world, and then to meet the President of the United States was a great honor. I think the main positive is being contacted by people you haven’t been in touch with for many, many years and to know that people still remember you. In fact, the most positive thing is that people actually enjoy hearing about it. They actually get pleasure out of talking to someone who had [the Nobel] experience. I understand that as a boy, you became interested in science after picking up a leaflet on Fluke worms in sheep at an agricultural show. One of the things that has happened with the prize, it is that I find myself telling the same story and even writing it. Only in retrospect, did I find it intriguing that I only remembered one thing about that show, and that happened to be a leaflet about a parasitic worm that I took home with me. I didn’t think, “Aha! This is what I want to study.” The decision came gradually, and it all really stemmed from Desmond Smyth, my professor at Trinity College. He was a fantastic man, the sort of teacher who changes people’s lives. He was very encouraging and engaged me in the study of parasitic worms. How did the decision to go to Trinity College come about? At that time and place, if you were a Protestant you went to Trinity, or perhaps to Queen’s University Belfast. If you were a Roman Catholic you tended to go to University College Dublin, or University College Galway or Cork. That is the reality of how it was at the time. One of the things I liked when I came to this country was what I naïvely perceived to be a lack of prejudice because people didn’t seem to know by looking at me whether I was Protestant or Catholic. Whereas in Ramelton, if a new person moved to town, everyone knew, before they even got there, whether they were Protestant or Catholic. It was ridiculous, but that is the way it was. How did you end up at the University of Wisconsin? As I was nearing graduation, a professor at the University of Wisconsin wrote to Smyth in Dublin. They knew each other’s work, and as a result of this contact, I applied to do research and graduate studies at Wisconsin. When I got there, my professor had a project on liver fluke that he and his department were working on. This was the giant liver fluke that is very pathogenic in deer and sheep, so it turned out to be the perfect spot for me. And this led to a job at Merck? Yes. The head of parasitology at Merck wrote to my professor at Wisconsin to see if there was anybody just finishing their PhD that he might recommend. I looked at the map of northern New Jersey and decided (unfairly, of course) that it didn’t look appealing. But my professor said, “Just go there and have the experience and stay in New York.” So that is what I did. It turned out that seeing the work being done at Merck, and meeting the people there, intrigued and impressed me. When I got back to Wisconsin, there was a letter offering me a job. Ivermectin, as well has having a huge impact on human diseases, has also made a difference in veterinary practice. How did it come about? Yes. I meet a lot of veterinary practitioners who tell me that. [The discovery] was a long process of finding a drug that worked against some worms, and then testing it against other worms, and following up with more testing, and more experiments. That involved a lot of hard work and a lot of persistence. Knowing enough about worms to draw analogies between the different types, and where they live and what they do, was a key factor. 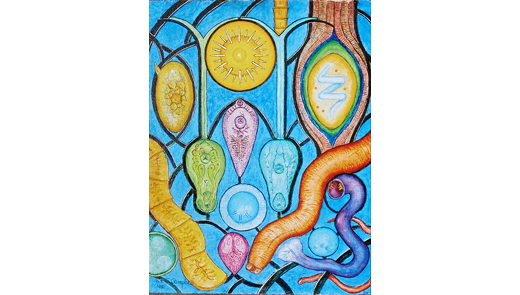 Parasite Window, 1992, featured in Campbell’s book, Poem, Paint and Pathogen. Was it a huge eureka moment when you realized that the treatment for parasites in horses might be used to treat humans? No, it wasn’t. I was very conscious of human worm diseases. While still at Merck, I was lecturing at New York Medical College on human parasitic worms. And I had been in South America on an Inter-American Fellowship in Tropical Medicine. So there was never a eureka moment for me. When you discover something active, you have a sort of subdued excitement because the chances are overwhelming that it is going to fall by the wayside. The vast majority turn out to be too toxic or too unstable or too stinky… But, on the other hand, there certainly were moments that were more important than others, some things that would shift the trajectory a bit, and therefore we might call them inflection points; certainly I am thinking about the horses here. Can you talk about the river blindness trials? I read that you persuaded Merck to make the drug available for free in poor countries. First of all, let me say that the trials were carefully done by the Merck medical people working with French tropical medicine experts in Africa. Any trial that is a first trial in humans has to be very cautious but this was out of the ordinary in terms of being cautious. And when it worked, there was some serious skepticism on the part of leading authorities that had do with people being susceptible to particular drugs and particular life stages being more dangerous to treat than other life stages, in terms of hypersensitivity, reactions and so on. But Merck decided to go ahead despite the skepticism and set up its own trials and not rely on some big international agency. And again, it worked just wonderfully well and the question then was what to do with it. As a pharmaceutical company, it would have been nice to sell it at a profit, but those most affected lived in poor countries, so there was no way people were going to get it unless it was donated. And this decision was decided by the chairman and CEO of the company in collusion with a handful of three or four top associates, and I was not one of them. To my mind, they are the ones, and the only ones, who deserve credit for that donation. I fed the pigs seven-year-old John Jameson whiskey because of reports that alcoholic beverages would prevent trichinosis, and published a paper on it. Yes, but you would have to drink an awful lot of it. It would be a very expensive and hazardous cure. Humans affected with trichinosis get tremendous fever and pain – pigs don’t get either. You can give them enough [trichinosis] to eventually kill them with infection, but they never get the fever. What are your thoughts on using animals in research? There is a big focus now on using one’s own autoimmune system to target disease. Yes, and some of it has to do with worms. There is a connection between early childhood worm infections and a stronger immunity. You can cure some diseases by infecting the person with worms. In Mexico, for a couple of hundred dollars you can become infected with worms as a cure for irritable bowel syndrome. You can get the treatment in London. It hasn’t caught on here because people are put off by the idea of worms. Most of the research is being done on the fringe. Established researchers won’t touch it. You have spent your whole career developing chemical answers to disease — but you’ve said that we need to look to nature for cures. Yes, absolutely. I believe that. We need to look at the immunological response and other biological approaches rather than chemical contrivances. We need to continue to work on other ways of interrupting life cycles and disrupting transmission of disease. One would hope that eventually [chemicals] would be replaced but certainly we are not anywhere near that yet, except in certain cases such as virus diseases. In terms of the Prize, you like to give credit to others, saying the discovery was a team effort. Right, that is really important. I’m a representative of the Merck company’s “team of teams” – parasitologists, chemists, microbiologists, and toxicologists. If there was a problem or an obstacle in one department, somehow it was solved. As obstacles arose, they got resolved. And of course, there was a lot of good fortune…things went better than one had any right to expect. How do you stay fit and mentally alert? The thing that I cling to, no matter how busy I get, is playing doubles ping-pong three times a week. It is very energetic and requires a lot of mental focus. I also kayak early in the morning. I love the serene atmosphere. When you have the lake all to yourself, it is such a source of refreshment. And of course, it’s good physical exercise as well. Also, I paint and write poetry. Those are things that you can keep on doing. Well, the painting you can keep doing. The poetry seems to be something that is either there or not there. Yes. I consider them beautiful. They are just doing their own thing and not meaning to be destructive. And I have said in some recent papers that the objective is not to get rid of parasitic worms, the objective is to get rid of parasitic diseases. One of your worm paintings actually looks like a stained- glass window. Yes. Several of them do. It is always the same stained glass window. One last question — as a scientist and as a person, do you believe in the afterlife? Ah. I cannot answer that. I have a very fuzzy but very important religious faith – you know, from growing up in a Christian household. When I say I can’t answer that, it is not just that I don’t want to (although I don’t want to) but it is because I don’t have an answer that satisfies me. I don’t believe in heaven with a big-bearded God and Saint Peter with a big keys at the gate and stuff. I am not a literalist in terms of religious faith. I am very liberal. In fact, I am a very fuzzy-minded person when it comes to those things… But I can’t let go of the belief that there’s something there.